The purpose of a police cordon is to provide a highly visible barrier to serve as a deterent for any person without authorised access to the scene of crime. It helps protect the scene against potential damage and contamination. The crime scene may already have been secured by the uniformed police officer who first attended the scene, but if not, the CSI will need to cordon off the scene to ensure that no person is able to access the scene after it has been secured. When the scene has been secured, it is said to be owned by the police, and it will not be returned to its original owner until after it has been thoroughly examined, and all necessary physical evidence has been recovered. In very serious crimes such as a murder, or suspicious death, an inner and outer cordon may need to be established, with the inner cordon surrounding the core of the scene (where the body is lying) and an outer cordon surrounding a much wider area in which evidence might reasonably be expected to be found. In less serious crimes, such as volume crime (e.g., burglary), no cordon is usually needed, and the CSI simply works within the confines of the property that has to be examined. There are several reasons for securing the scene. First and foremost is the need to prevent contamination of the scene and any evidence in the scene. The scene can be contaminated by people (including all those who "officially" attend the scene, as well as the curious public, press and media who have an interest in what's going on inside the cordon). And contamination can also occur because of changes to weather conditions, so it is important too to protect the scene from weather conditions which might damage the scene after the crime has occurred. 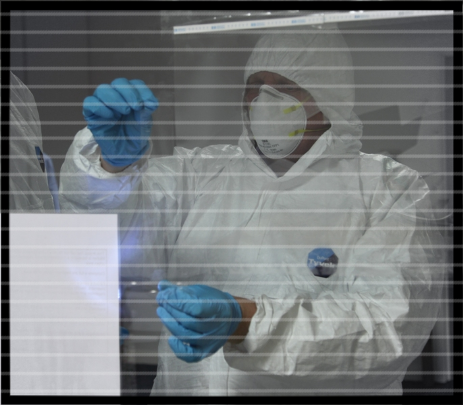 The CSI will almost certainly need to wear personal protective clothing (PPE) such as a scene suit, over shoes, and gloves both to reduce the possibility that they might themselves contaminate the scene (by shedding hairs in to the scene for example) and to protect themselves from potentially hazardous substances (such as the powders or chemicals they use at the scene of crime). The CSI must take every reasonable precaution to protect themselves against harmful substances and from depositing trace evidence from themselves at the scenes of crime they attend. This is achieved by wearing a suitable scene suit, over-shoes, mask and gloves.